Here at VisitNland HQ, we're huge fans of making the most of the little things. Life is what you make of it, and it's far too precious to worry so much about the big things that you miss out on all the moments that can turn your frown upside down! Spot shapes in the clouds, smell those flowers, drag your family along on a woodland walk. Make memories to last a lifetime. To get you inspired, we've compiled a list of things we're going to celebrate in June... just because we can. From the Northumberland Miners' Picnic to the Summer Solstice, how many will you celebrate to make your June joyful? Celebrate local food and drink on Saturday 10th June! Pack a bottle of the double award-winning Hepple Gin into your picnic basket, along with other great local produce, and head into the Northumberland National Park with friends or family. One of England’s most tranquil parks, you’ll be spoiled for choice with beautiful picnic spots to while away a peaceful afternoon. Remember Northumberland’s rich mining heritage and celebrate its strong community spirt at Woodhorn Museum on Saturday 10th June. Discover some of the regions tastiest food and drink at the food stalls and beer tent. Get creative with pop-up arts & crafts workshops. Remember the people and industry that founded the miners’ picnic with the Miners’ Memorial Service. Local band Lindisfarne headline a fantastic programme of performers on what’s set to be a fun family-friendly day out! What better way to celebrate the UK’s first ever National Beer Day on Thursday 15th June than at an award-winning country pub? The Feathers Inn at Hedley-on-the-Hill is little changed in 200 years with wood burning stoves, bare wooden tables and exposed stone work. The menu changes daily to suit the local ingredients at hand, as well as a well-stocked bar full of options for every patron. Celebrate Father’s Day Sunday 18th June with a few rounds of golf at one of Northumberland’s many great golf courses. Enjoy the sea breeze as you tee off on links along the coast; admire the lush green scenery surrounding parkland courses inland. If you’re feeling particularly generous, treat your dad to a night away at Matfen Hall Hotel, Golf & Spa. 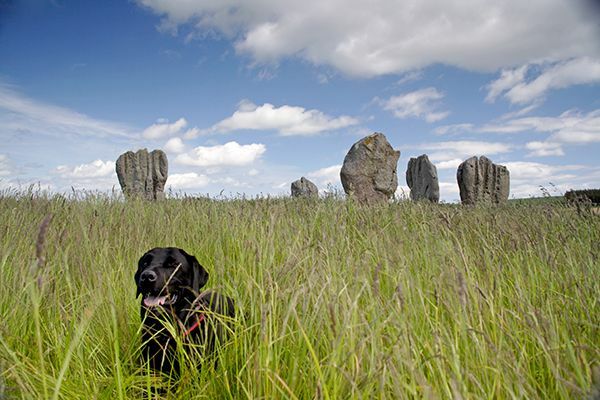 Celebrate the Summer Solstice on Wednesday 21st June with a trip to the Duddo Standing Stones on the Ford & Etal Estates. Northumberland’s answer to Stonehenge, this mysterious stone circle is said to be over 3,000 years old. Set in picturesque countryside close to the Scottish Borders, it’s the perfect place to get back to nature. Take the time to celebrate man’s best friend on Sunday 25th June! Chances are you’re not at work or there’s a No Pets policy in your office, but don’t let that deter you and your pooch from having some quality time. The wide, sandy beaches of the north Northumberland coast are dog heaven. Once you’re both tired out, the Bamburgh Castle Inn at Seahouses is a great dog-friendly pub to grab a bite to eat. Celebrate the beauty of the Northumberland Dark Skies with a stargazing evening at Kielder Observatory on Friday 30th June. We can’t promise any asteroids, but Jupiter and Saturn are due to grace the skies that night; or how about a Late Night Aurora session to see the mesmerising Northern Lights? End the month on a scorcher with a trip to the North East Chilli Fest from Friday 30th June! Located at a new site in Seaton Sluice overlooking the sea, tickle your taste-buds at the stalls of chilli traders from all over the country. Eighties icons Heaven 17 are set to headline the entertainment.